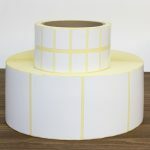 They are used wherever paper labels do not work, due to their durability, non-scalability, flexibility (the possibility of applying to irregular packaging), resistance to moisture, temperature jumps, absorption of chemical and oily substances, or extreme weather conditions. They are made of transparent, white and metallized films of various thicknesses. Used in all branches of industry, including in the chemical, food, electronic and automotive industries. They are also suitable for further printing in thermal transfer and thermal label printers. 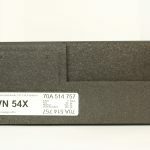 PP foil (polypropylene foil) – hard and inextensible, high resistance to mechanical damage, including tearing. Ideally suited for the determination of smooth surfaces, such as electronic components, due to resistance to very high temperatures. These raw materials have appropriate certificates, allowing their use in the food industry and the chemical industry. The foils have different properties when it comes to the outer material. The main difference between film and paper labels is the durability of the product. 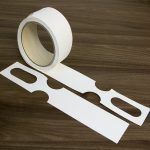 Printing on the film, due to the increased resistance of the material, allows for longer exposure of labels or stickers and gives the possibility of storing and presenting them in almost any external conditions. Depending on the purpose of the label, we can opt for a more economical option – printing on paper. 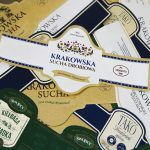 Paper labels can be additionally protected with a protective layer, eg in the form of UV varnish, which will extend its durability while maintaining a lower price of the raw material. You can choose matte or glossy paper. The price of the material on which our labels will be printed translates directly to the price of the label – our sales department, in cooperation with technologists, will be happy to advise you on the selection of the right type of raw material.